If his appearance in the Knesset yesterday is any indication, Prime Minister Ariel Sharon seems to think that the expulsion of thousands of Jews from their homes is just one big joke. Speaking to the Foreign Affairs and Defense Committee, the premier was grilled with some tough questions about his planned withdrawal from Gaza and northern Samaria, but instead of addressing these gravely serious issues, he chose to stoop to humor instead. JERUSALEM – Prime Minister Ariel Sharon chose to resort to humor as he faced tough questions from members of the Knesset State Control Committee Monday. Sharon spoke before the committee today in response to criticism expressed in the State Comptroller’s report over preparatory work at the Prime Minister’s Office ahead of the pullout. During the session, right-wing Knesset members presented Sharon with a series of questions regarding the upcoming settlement evacuation and the decision-making process that led to it. The prime minister, known as a public relations wizard, mostly read pre-written answers and refused to address the preparatory work undertaken ahead of the disengagement. 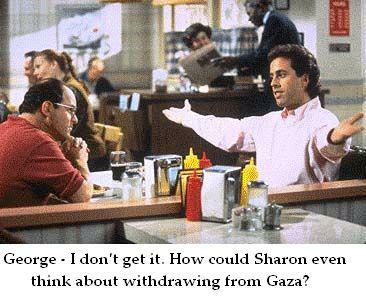 If the people of Israel wanted a stand-up routine, they would put on Seinfeld. Sharon’s responsibility is to provide the country with answers – not to dodge their questions with smart-aleck responses. Throwing people out of their homes is no laughing matter – and it is a shame that the leaders of this country lack the sensitivity to even realize that.